Auto-Adjust Technology Thanks to Automaxx® Auto-Adjust Technology, Wood Project Clamps adjust to match material thickness automatically with a simple squeeze of handles — whether the material is thick, thin, or in between. You can clamp a 2x4 and then a piece of 1/2" plywood without ever readjusting the clamp. 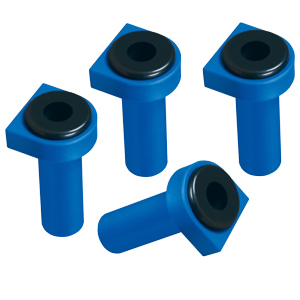 Easy-to-Regulate Clamping Pressure Easily regulate clamping pressure with a simple thumbscrew. Just set your desired pressure by turning the thumbscrew for more or less pressure. Once the pressure is set, the clamp maintains consistent clamping pressure with every thickness. Highly-Durable Construction Wood Project Clamps are designed to withstand years of heavy use, thanks to heavy-duty, all-metal construction. They also have ergonomic padded grips for comfort and ease-of-use. 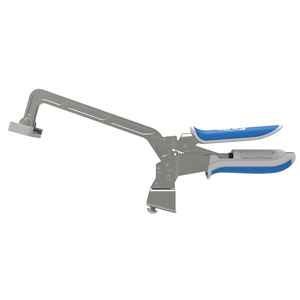 The Kreg line of Face Clamps helps to ensure a perfectly flush joint every time. Without clamping, the joint can misaligns if the screw follows the grain of the wood. To use, place the large pad of the clamp directly over the center of the joint line on the face side of the work piece(opposite the pocket holes), clamp with moderate pressure and drive a screw. Best for the majority of pocket-screw applications. 3" (76mm) reach will handle work pieces up to 2-3/4" (70mm) thick. 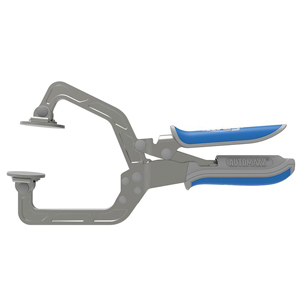 All Kreg Face Clamps features an extra-large pad that is placed on the “show side” of the joint to help create a flush joint as the screws are driven. 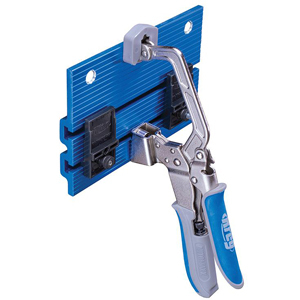 The clamp is also compatible with the Kreg Jig® R3’s Portable Clamp Adapter so the jig can be connected directly to the clamp for high-speed panel drilling. 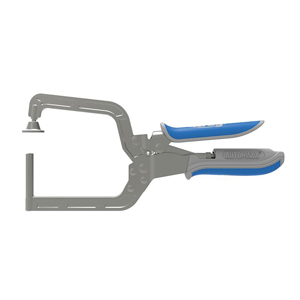 Each Face Clamp has ergonomic padded grips for comfort and ease-of-use. These versatile clamps are perfect for creating flush-fitting assemblies with Kreg Joinery, and they're great for project assembly, routing, cutting, sanding, drilling, and more. Bench Clamps work with Clamp Trak and Plates, the Clamp Table, Mobile Project Center, and more to secure workpieces using an extra-large padded clamp face that evenly distributes clamping force. Auto-Adjust Technology Thanks to Automaxx® Auto-Adjust Technology, Bench Clamps adjust to match material thickness automatically with a simple squeeze of handles — whether the material is thick, thin, or in between. You can clamp a 2x4 and then a piece of 1/2" plywood without ever readjusting the clamp. Highly-Durable Construction Bench Clamps are designed to withstand years of heavy use, thanks to heavy-duty, all-metal construction. They also have ergonomic padded grips for comfort and ease-of-use. 6" reach with 5" capacity. Create an incredibly strong & versatile clamping station virtually anywhere you need one. The Klamp Plate™ can be quickly routed into any wood or composite work surface such as work benches, saw horse, table saw extensions, etc. Once installed, it accepts any Kreg Bench Klamp™. When not in use, you can remove the Bench Klamp™ to regain your flush work surface. Router template for Kreg® Bench Klamp Plate™ Installation. This is a MDF template that allows you to mill your own workbench, table, etchttp://www.ptreeusa.com. for Kreg's Klamps Plate™. Simply attach the template with included screws to the desired position on your work surface, set the depth of the router bit for the thickness of Klamp Plate™ and template, and mill out the hole for the Klamp Plate™. The corners of the milled hole will need to be chiseled square or round the corners of the Kreg® Klamp Plate™. We suggest using Milecraft® Bearing Guided Router Bit, Item #10117 or equivalent. Note: Bench Klamp not included. One Amazing Clamping Station The Kreg Clamp Table combines several of our Clamp System Components into one amazing clamping station. Once secured to the adjustable heavy-gauge steel stand, the Kreg Clamp Table provides the ultimate clamping solution for Kreg Joinery and almost any other woodworking task. Whether you’re joining, sawing, sanding, or routing, having a table that was designed and built with clamping as its primary focus makes all the difference in the world. 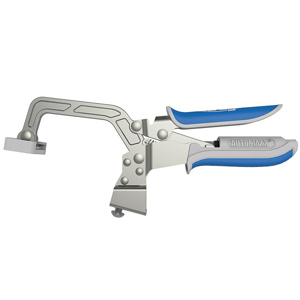 Auto-Adjust Technology Thanks to Automaxx® Auto-Adjust Technology, included Bench Clamps adjust to match material thickness automatically with a simple squeeze of handles — whether the material is thick, thin, or in between. You can clamp a 2x4 and then a piece of 1/2" plywood without ever readjusting the clamp. Flexible Positioning Stop working around your clamps and start working with them. 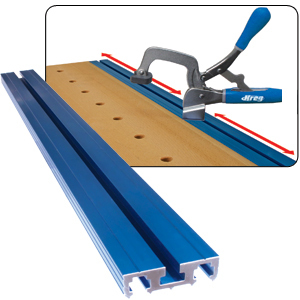 The Clamp Trak allows you to position your Kreg Bench Clamps and Clamp Blocks along the table’s edge and quickly remove them to regain your flat work surface. Precise Alignment Made from durable plastic, Kreg Clamp Blocks can be positioned anywhere along the Clamp Trak, allowing you to quickly register workpieces and bring your entire project into alignment. Durable Work Surface Made from replaceable, glue-resistant melamine, this large 213/4" x 333/4" work surface is perfect for sanding, sawing, drilling, routing, joining, lay outs, and almost any other task. Rigid Foundation The adjustable heavy-gauge steel stand is the perfect foundation for the Kreg Clamp Table. Adjustable from 29" to 35", this heavy-duty steel stand includes levelers to compensate for uneven floors. Add Heavy-Duty Casters for even more mobility. Versatile Clamping Are you always looking for the right clamp? The Kreg Bench Clamp is great for almost any woodworking task. It slides across the Clamp Trak, rotates 360 degrees, and locks firmly into place wherever you need it. The Kreg Clamp Table is the ultimate clamping solution for Kreg Joinery and works with the entire family of Clamp System Components. 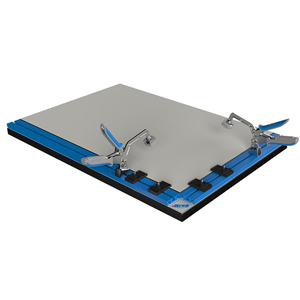 If you’ve ever struggled to get perfectly flush Kreg Joints, failed to get your clamps positioned exactly where you need them, or needed an extra set of hands around the workshop, the Kreg Clamp Table is your perfect solution. Note: This is the same table included in the Clamp Table and Steel Stand Combo, but comes without the stand so that you can place it wherever you need it. Durable Work Surface Made from glue-resistant melamine, this large 213/4" x 333/4" work surface is perfect for sanding, sawing, drilling, routing, joining, and almost any other woodworking task. Flexible Positioning Stop working around your clamps and start working with them. The Clamp Trak allows you to position your Kreg Bench Clamps and Clamp Blocks anywhere along the table’s edge and quickly remove them to regain your flush work surface. Precise Alignment Made from durable, impact-resistant plastic, Kreg Clamp Blocks can be positioned anywhere along the Clamp Trak, allowing you to quickly register your workpieces and align your project. 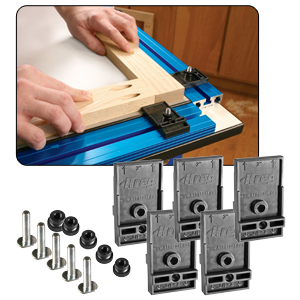 Versatile Clamping The Kreg Bench Clamp is great for almost any woodworking task. It slides across the Clamp Trak, rotates 360 degrees, and locks firmly into place wherever you need it most. Universal Clamp Trak™ Kits offer a great new clamping solution that will help you accomplish a wide variety of common woodworking tasks. The Kits do this by allowing you to incorporate the versatile clamping capability of the popular Kreg® Clamp Table™ into any workbench—whether it’s a new or existing bench. Each Universal Clamp Trak™ Kit comes with longer versions of the same anodized aluminum Trak™ used in the Klamp Table™, plus hardware and instructions that show you how to incorporate them into your workbench. With these Traks™ and couple of Kreg® Bench Clamps (sold separately), you will be able to have a workbench and a multipurpose clamping station in one unit that can hold pieces large or small. Add mobility to your Universal Steel Stand with Kreg Heavy-Duty Casters. 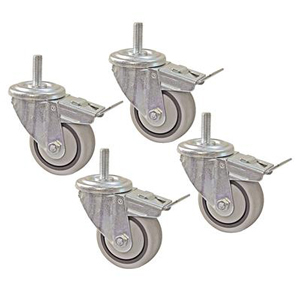 Built to last and perform, these casters feature a dual-locking mechanism that won’t roll or pivot once engaged, resulting in an extremely stable work station. The Kreg® 90° Corner Clamp gives you the helping hand you need to hold 90° corners and “T” joints together securely when you’re assembling boxes, drawers, cabinets and cases. Plus, the 90° Corner Clamp leaves both of your hands free to add your fasteners. The 90° Corner Clamp is the fastest, easiest-to-use corner clamp you can buy thanks to Kreg Automaxx® auto-adjusting technology. 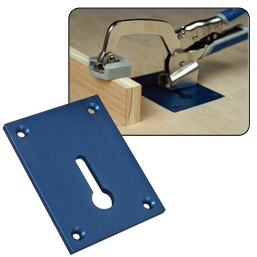 The 90° Corner Clamp helps hold assemblies like boxes, cabinets, drawers and cases together to ensure that you get strong, tight-fitting assemblies—whether you’re using Kreg pocket-hole joinery, or another method. The clamp’s V-wedge jaws grip the mating pieces securely, ensuring that the pieces sit at precise 90° angles while you drive in Kreg Screws, or even another type of fastener, such as a nail or wood screw. The 90° Corner Clamp features all-metal construction, including cast-aluminum pads—an outer "V" and inner wedge—that press against the inside and outside faces of the two pieces being joined in order to hold those pieces at a 90° angle to one another. Edge stops also help align the edges of the pieces to ensure accurate assembly of structures like boxes, cabinets, drawers, and cases. 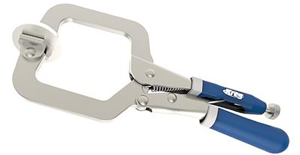 Thanks to Automaxx® auto-adjust technology, all you have to do is squeeze the clamp handles. The clamp will automatically close with the amount of pressure you have set, regardless of the material, whether you’re using thin plywood for drawers, or materials up to 1" thick. 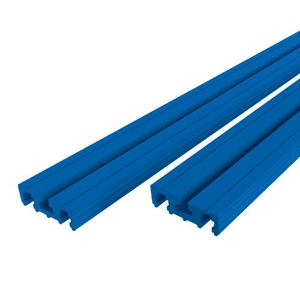 These simple 3/4" reinforced nylon Bench Dogs will help make your next project easier. Included with each Bench Dog is a solid rubber Bench Brake that can be placed on top of the Bench Dog for a solid, non-slip work surface – perfect for routing and sanding. When used with the Klamp Trak™, these simple blocks allow you to quickly and accurately register your stock to the edge of your work space and bring your entire project into alignment. Quick and easy squaring. Especially useful for face-frame construction. Made from durable, impact resistant plastic. The Klamp Trak™ lets you turn an entire workbench or sawhorse into a clamping station. 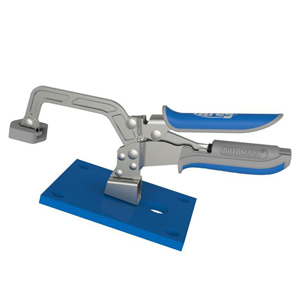 The Klamp Trak™ can be quickly routed into any wood or composite work surface, such as a workbench or sawhorse, or staggered between two 3/4"-thick panels to provide a flush-mounted clamping plane anywhere you need it. 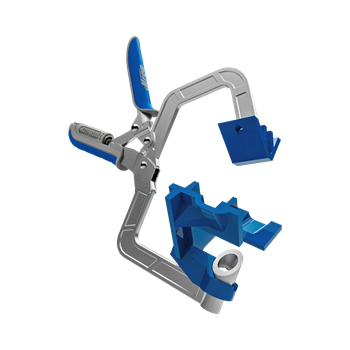 Once installed, it accepts any Kreg Bench Klamp™ to give you complete control over where you position your clamp. When not in use, you can remove the Bench Klamp™ to regain your flush work surface. For 360° clamping on the go, check out the Heavy-Duty Bench Clamp System. It combines a 3" Bench Clamp with a thick 10" x 10" powder-coated steel plate. Rubber feet allow this system to be used anywhere. Or, the plate can be recessed into a work surface. Thanks to Automaxx® Auto-Adjust Technology, the Bench Clamp adjusts to match material thickness automatically with a simple squeeze of the handles—whether the material is thick, thin, or in between. 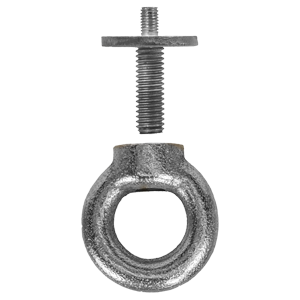 The clamp allows easy regulation of clamping pressure with a simple thumbscrew. Clamp Using the Pocket Hole The steel pin on this clamp is shaped to fit snugly into a pocket hole, securely anchoring one workpiece against the other for easy assembly. Just drive a screw into an adjacent pocket hole while the Right Angle Clamp holds the piece steady for you. Swivel Pad for Solid Clamping The arm opposite the pin features a pad that swivels to fit tight against your material, so you can count on solid clamping without a chance of the joint shifting. 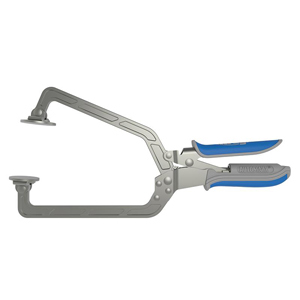 Ultra-Wide Reach Whether you’re joining two thin drawer sides for a cabinet, or thicker materials to frame an outdoor project, the Right Angle Clamp opens wide to get the job done. Use One Clamp, or Use Two Many woodworkers find it handy to use two Right Angle Clamps when assembling large workpieces. Place a clamp on each end to hold the wood while you drive screws in the remaining pocket holes.